Though kinkajous and olingos are extremely similar in appearance, behavior and habitat, they are separate animals. Both kinkajous and olingos are members of the Procyonidae family of mammals, which includes coatis and raccoons. Despite their close biological relationship and similar ranges and habits, kinkajous and olingos have some important differences. The kinkajou (Potos flavus) is a medium-size carnivore that makes its home in the treetops of tropical forests. Kinkajous can reach body lengths of approximately 17 to 22 inches, with thick prehensile tails that can match their body in length. Kinkajous are often golden-brown, with a thick coat of downy fur. In many areas where kinkajous reside, locals call them night monkeys or honey bears because they look somewhat like those animals. Olingos (Bassaricyon gabbii) resemble kinkajous at first glance, but a number of traits make them fairly easy to distinguish. Foremost is the tail. Kinkajous have uniformly colored, prehensile tails that taper at the end, but olingos have comparatively bushy tails that are neither tapered nor prehensile. Olingos often have faint, dark rings in the fur of their tails. Slightly smaller than the kinkajou in length, the olingo is also slimmer and more compact, weighing on average about half of what a kinkajou does. Their gray to yellow coloration also distinguishes them from their golden-brown cousins. The geographic ranges of kinkajous and olingos overlap throughout much of their native habitats. Kinkajous have a much larger range than olingos, from southern Mexico through Central America and into southern Brazil. Olingos are most often found in Central America and northern South America, ranging from Nicaragua to Bolivia. Some are scattered in the western part of the Amazon basin. These animals tend to favor similar habitats. Kinkajous are more flexible, finding homes among the trees in tropical forests, rain forests, coastal forests, evergreen forests and forests bordering savannahs. Olingos are more selective, preferring the canopies of evergreen forests and trees along forest borders. Kinkajous and olingos alike are primarily frugivores. They tend to prefer fruits, insects, honey, small animals, flowers and nectar. Their feeding behavior makes both animals dispersers of seeds, which helps develop their forest ecosystem. Because of the great amount of overlap in geography, habitat and food habits, kinkajous and olingos compete over resources. 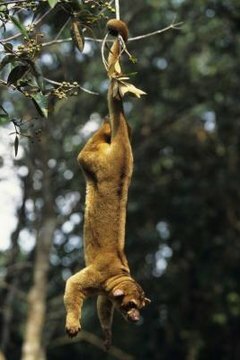 In Panama at least, competition from the more abundant kinkajou could limit the population growth of the locally scarce olingo, according to a 2000 study from the New York State Museum. Though kinkajous have been sold as exotic pets for many years, they are not domesticated and they don't make good pets. Kinkajous, while cute and cuddly-looking, can be destructive and occasionally aggressive, and they can deliver painful bites. The San Diego Zoo suggests that the exotic pet trade might play a role in reducing their population. If you purchase a kinkajou as a pet, make sure that it is legal to own where you live, that it's been hand-raised from infancy, and that it comes from a reputable breeder. Olingos are less commonly sold as exotic pets. The IUCN Red List of Threatened Species cites the capture of young olingos for the pet trade as a threat to these creatures.